Effect: You lay out a bunch of cards on the table and have a member of your audience pick one. Your assistant goes out of the room while this is done. The assistant is called back in and knows the person's card! This is repeated. Card Trick: 1. Have an assistant with you who knows exactly how the trick works. 2. Lay out ten cards in the same layout as the spots on a 10 card (four on each side and two in the middle). The card in the upper left-hand corner must be a 10. (Editor's suggestion: After the audience has shuffled the deck, look through it--perhaps pretending to find and remove any jokers--find a 10, and casually cut the deck so that the 10 is on top. 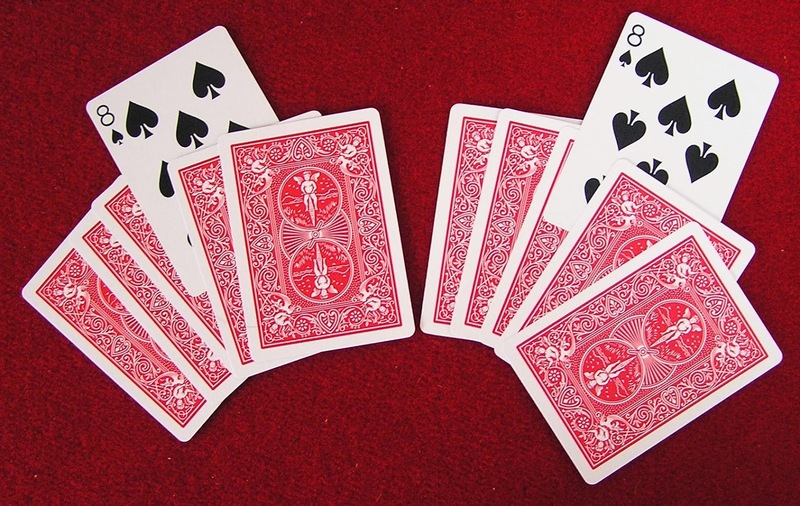 Turn the deck face down and deal the top ten cards into the layout, starting in the upper left-hand corner. --RS.) 3. Have your assistant leave the room. Ask an audience member to help you with the trick. Have the person point to one of the cards. 4. Call your assistant back into the room and start pointing to cards one by one, saying "Is it this card?" until the assistant stops you. (Or the assistant might stop you and identify the card any time after you've pointed to the first few cards.) The secret is that when you point to the first card, which must be the 10 in the upper left-hand corner, you point to the symbol (diamond, heart, etc.) whose position on the 10 card corresponds to the position of the selected card among the cards on the table. Therefore, your assistant knows the person's card as soon as you've pointed to the first card, the 10. 5. If you want an even more amazed response from your audience, tell the audience member to try to trick your assistant at one point by not picking a card. When you start pointing to the cards again with your assistant, point to the empty space in between the two middle symbols on the 10 card! This will have your audience thinking for hours on hand! Editor's suggestion: You should probably point to the cards in the same sequence every time: start in the upper left corner and proceed through the layout from left to right and from top to bottom. Otherwise the audience can easily invent other ways the trick might work such as pointing to the selected card after pointing to any three others.